Will Jamal, Grover, and Milk become the stuff of legends? 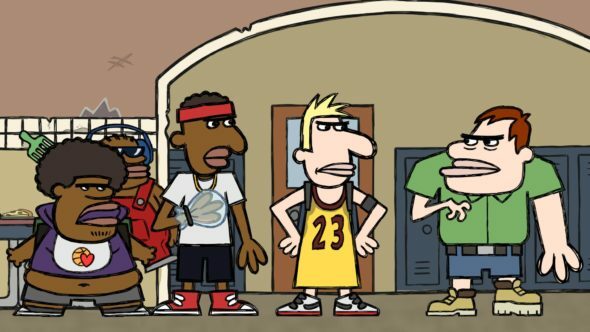 Has the Legends of Chamberlain Heights TV show been cancelled or renewed for a third season on Comedy Central? The television vulture is watching for the latest cancellation and renewal news, so this page is the place to track the status of Legends of Chamberlain Heights season three. Bookmark it, or subscribe for the latest updates. Remember, the television vulture is watching your shows. Are you? An animated adult comedy on the Comedy Central cable channel, Legends of Chamberlain Heights was created by Brad Ableson, Mike Clements, Quinn Hawking, Josiah Johnson and Michael Starrbury. The sitcom follows three high school basketball players. Jamal (Hawking), Grover (Johnson), and Milk (Starrbury), are really just benchwarmers. Together, these three friends experience life’s highs and lows. Comedy Central says, “Failure doesn’t faze them since they’re legends — even if it’s just in their own minds.” The voice cast also includes: Jay Pharoah, Tiffany Haddish, Jamie Kennedy, Poochie Jackson, Carl Jones, Elise Marie Dubois, and Lavell Crawford. The second season of Legends of Chamberlain Heights averaged a 0.09 rating in the 18-49 demographic and 208,000 viewers. Find out how Legends of Chamberlain Heights stacks up against other scripted Comedy Central TV shows. As of April 19, 2019, Legends of Chamberlain Heights has not been cancelled or renewed for a third season. Stay tuned for further updates. The network has had great success with South Park for two decades, and Dr. Katz, Professional Therapist and Futurama had respectable runs. Other than those series though, most of the cabler’s animated sitcoms have been a one, two, or three season endeavor. Witness Moonbeam City and Ugly Americans, as well as Lil’ Bush. It’s difficult to tell from the ratings however, I think Legends of Chamberlain Heights will be renewed for a third season. Comedy Central picked up season two, before the series even premiered, which is a sign that they have faith in it. Also, the second season was ready to premiere just nine months after season one kicked off. Although that may not seem super impressive, some animated series get bogged down with production issues (I’m looking at you, Rick and Morty), which doesn’t seem to be the case here. What’s more, co-creator Brad Ableson worked on The Simpsons, between 1996 and 2015, so he has certainly “made his bones,” as it were. Speaking of bones, for now, I’ll seek my supper somewhere else. Subscribe for free updates on any cancellation or renewal news. Find more Legends of Chamberlain Heights TV series news or other Comedy Central TV show news. What do you think? Should Comedy Central cancel or renew the Legends of Chamberlain Heights TV series for a third season? Renew! Renew!Renew! This show is great! I thought when I saw the previews that this atoon (adult cartoon) was going to be some ****, but after I watched an episode… that **** was funny as ****!! Pleeeez bring it back even if not on cartoon network!!!!!!! Hilarious and witty, I absolutely love it. Please don’t put this show to sleep. Too late, it was cancelled months ago. They. Need to renew it. **** demographics the fans love the show. Definitely should be renewed for a third season! Easily one of the funniest animated series ever. Expertly written and the voice cast is amazing!